It was my mother’s birthday. It was also my birthday. Well, it was actually neither, but it was close enough. It seems my (slightly belated) 30th birthday present to my mother was labour pains. But another three decades have since passed, and she’s forgiven me. I’m not sure she’s forgiven me for the fact she’ll never have a daughter-in-law, but that’s not the point of this story. For our combined birthday dinner, we decided to go out for Peking duck. As a family, we’d been to Old Kingdom years ago and enjoyed ourselves, so the first intention was to try Simon’s Peiking Duck Restaurant, but it was fully booked when I called. I started trawling the foodblogs for other options, and came across Happy Cook. Apparently the owners used to own a restaurant called Fortuna Village in the city, which was kinda big in the 80s? This is what my research told me. Given that I was living in rural Victoria back then, I didn’t really know – or care – that much about this ambit claim. All reports seemed to be pretty positive, so I went ahead and booked. My sister got a bit lost trying to find the place, as a typo on some site had her looking on the other side of Springvale Road for it. And you could be forgiven for missing it even if you were looking on the right side of the road – it’s a pretty non-descript shopfront in a small strip of non-descript shopfronts next to Nunawading station. When I walked in, I was a little worried that I’d chosen the wrong place for a double birthday dinner. There were mismatched tables – some with white tablecloths and others red, and there were also decidedly 80s chairs with chrome legs. Of course, I should have known better than to judge a Chinese restaurant by its decor, and looking at the mostly-Chinese-families clientele, as well as the food on their tables, I was soon put at ease. We had pre-ordered two ducks between five of us. I had pretty much assumed that we’d just have the two course duck – there’s no ‘spit soup’ as Jess Ho calls it, at Happy Cook – and that would be it. Like at Old Kingdom, right? But the proprietor wandered over and suggested we try some other dishes as well. We resisted, though did order a dish of beans, as I was feeling like some more vegetables than the duck banquet entailed. And then the duck arrived. A little disappointingly, it arrived completely carved – there was no table service theatre, unlike other Peking duck restaurants. Still, you could tell they had just carved it out the back, because the duck was still warm and moist. And there was a lot of it! Too much for the amount of pancakes; I swear, these duck places must have a business model which is based on you ordering extra pancakes! The duck was moist, tender, and juicy. The skin was wonderfully crisp too, though – and it’s not often you’ll hear me say this – a little too fatty. It would have been great with a little more of the fat rendered out. The pancakes themselves had that barely-cooked wheat flour taste to them, which marries well with the rich muskiness of the duck, the sweetness of the hoisin sauce, and the cleansing lightness of the cucumber and spring onion. My mouth waters just recalling this. 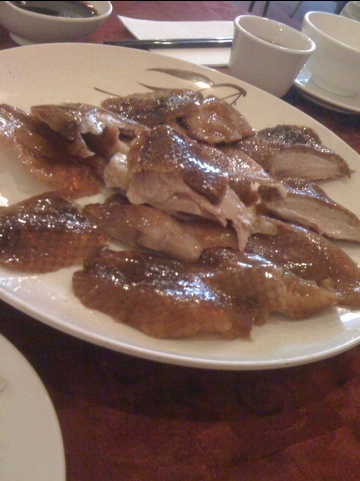 The Peking duck involves a second course – you can choose to have duck meat (stripped from the carcass after the prime Peking duck slices have been taken) stir-fried with noodles, or with bean shoots. The speed at which this dish comes out after you’re done with the pancake course would suggest that you’re not actually getting the duck meat from your duck, but that doesn’t really matter that much, does it? The noodles weren’t that great – they lacked any assertive seasoning, and were just bland, for the most part. They were also a bit over-cooked, leaving them too soft, and a bit mushy. The bean shoot dish – which I forgot to photograph – was much better. Bean shoot stir-fries are almost always great! These were the beans we ordered. They were pretty tasty, and well fried, giving them that slightly crispy, wrinkly outer shell that I love. All in all, was it worth the trek out to Nunawading? I’m not so sure. It was good, but not so much better than Old Kingdom, which is much less of a hassle to get to. I love the Happy Cook- it is always my birthday choice because we live miles away and can’t be bothered heading into the city. It is my favourite duck. Oh, if you’re somewhere near the area, it certainly is a good option! Have you tried the new Simon’s Peiking Duck place yet? We’ve been going to Little Beijing House for Peking Duck in Blackburn which is about 3 minutes drive from Simon’s Peiking Duck. Friends who’ve had both say Simon’s is greasier and more expensive. While Little Beijing House is more basic in decor and service, I like that I get to take the carcasses home, so the rest of the meat is mine to use in dishes and the frame to make congee.